On Febuary 26, 2014 The Capitol Corridor plan was presented to a formal meeting of the Tri-County Regional Planning Commision that voted to accept the report on the spot. 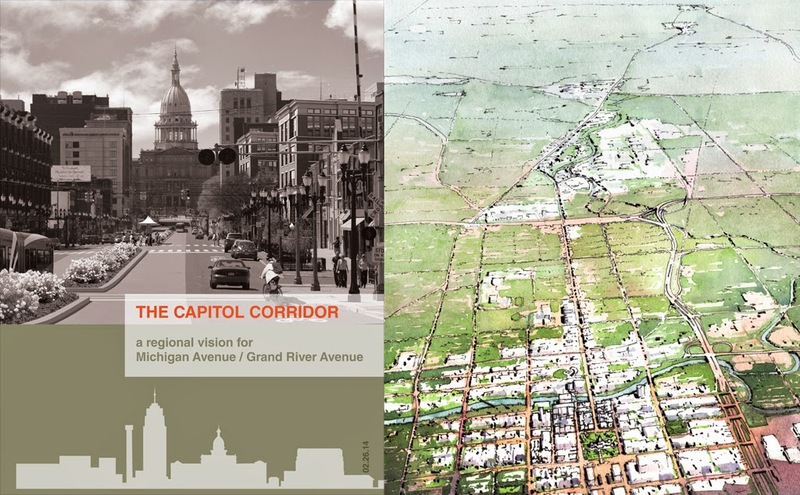 Following a year-long process working under the leadership of the National Charrette Institute (NCI), Dover-Kohl led two 7-8 day charrettes along the Michigan Avenue / Grand River Avenue corridor that provided the opportunity for an in-depth community conversation about the future urban form of the corridor, and produced a consensus-based vision for urban design, land use, transportation, and economic development. The Capitol Corridor plan extends approximately 19-miles from the capitol building to the town of Webberville. Spanning 10 municipalities, the corridor transverses cities, towns and countryside. It is the identifying address for institutions such as Michigan State University and Sparrow Hospital, and contains shopping and entertainment destinations, workplaces, and residences. The resulting report outlines a vision to guide future growth, change and preservation in the corridor generated by residents, property owners, stakeholders and technical experts, municipal staff, public officials, and the planning team over the course of the two charrettes; it also provides recommendations for municipalities and key stakeholders to carry these ideas to implementation.